Sakara writes: "After spying some of my mates on this site i had to add myself and my partner. 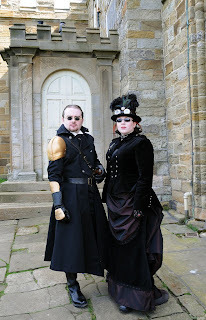 taken at Whitby Goth weekend this April, where it was probably the best weather it has been there for a long time! ...Strangely enough although I was wearing velvet and a corset underneath I wasnt hot! Years of practice i guess! Also great bonus about wearing steampunk stuff.. sunglasses work! lol"
I like your technique Sakara, although I suspect your partner was hiding the truth about his heat rating - His right arm has clearly ceased to function and is being held on only by a solid metal plate. Hi Sakara nice to see you are making use of the photos I sent. If you post them on any other sites please let me know, it is nice to see where they end up. lol...i couldnt remember who took this one!!!! Harry and Hermione go gothic.